This morning was supposed to be my last at Sundance, but the weather had other ideas. Not the weather here in Park City, mind—that’s been unseasonably warm and pleasant, unblemished by the kind of snowstorms that often make getting around the mountain town a challenge. But back in Chicago, where wind temperatures are so historically low that they’ve had to light the tracks on fire to allow the trains to move, many flights are grounded—including the one that was scheduled to land in Salt Lake City this afternoon, before taking me back to the (very, punishingly) Windy City. Like the snowed-in family of The Lodge, the festival’s cabin-fever creepfest par excellence, I’m not going anywhere. I was done with Sundance but Sundance isn’t done with me. That’s not a complaint. Real life (and subzero temperature) can wait. Another day in Utah’s cinephile snow-globe means a chance to catch at least a couple more movies—and a second chance to address the scheduling goofs and oversights that come with the territory at any film festival but especially at Sundance, where it’s impossible to see everything or even everything folks are liking. (Why are reactions here so glowing? Blame the altitude, the general giddy camp vibe of the fest, or a general desire to make a “discovery” or get in on the ground floor of a phenomenon.) Usually, I leave Sundance with a nagging feeling that I followed the wrong branch of my own personal Bandersnatch. One more day allows me to choose a different adventure. This one will star Adam Driver. A pro-wrestler biopic that’s hitting theaters in a couple weeks probably wasn’t the best use of my precious Sundance time. But at a fest filthy with attempts to make everyone feel good, a little honest uplift is worth savoring, even when it comes packaged in cliché. Shown as this year’s “secret” screening, which was even less secret than usual (news broke before the festival even began, and the film is showing again tonight), Fighting With My Family (Grade: B-) is a shamelessly formulaic but fairly irresistible crowd-pleaser with a weird pedigree. Written and directed by the comedian Stephen Merchant, who co-created The Office, it loosely retells the Cinderella story of WWE Divas Champion Saraya-Jade Bevis, a.k.a. Paige (played here by Lady Macbeth’s Florence Pugh), who grew up performing in her parent’s Norwich wrestling federation with her older brother, Zak (Jack Lowden). As the movie tells it, both were invited to try out for the WWE. But only Bevis made the cut, leaving Zak, the bigger star of the family business, sitting on the sidelines of their shared dream. Making no attempt to disguise its dual function as branded entertainment, Fighting With My Family is at its least likable when gushing over the WWE as a benevolent corporate entity, making dreams come true for the lucky few; a two-scene cameo by The Rock, playing himself as an endlessly patient and warm-hearted fairy godfather, is so worshipful that it threatens to undercut the star’s massive charm. But while Merchant fully embraces the hoary conventions of the sports drama, offering more training montages than a Rocky sequel, he also takes care to invest them with specificity and some genuine pathos (his film cares, among other things, about wrestling as a craft, acknowledging the nuances of improvisation and choreography), while goosing the rags-to-riches arc with plenty of his signature dry comedy. 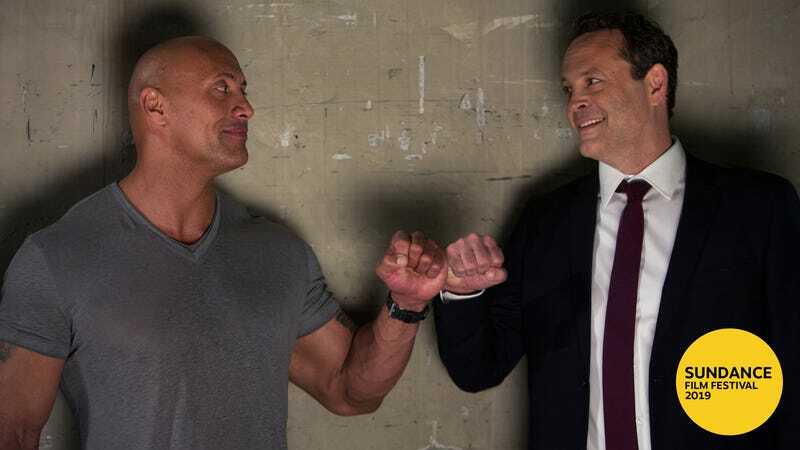 He’s assembled a very good cast, too, from Nick Frost and Lena Headey as Bevis’ wrestling-nut folks to a surprisingly affecting Vince Vaughn as her tough-love coach. And while Pugh, who’s already a costume-drama mainstay, is perhaps technically cast against type here, she’s radiantly sympathetic as Paige. The film’s cornball upshot wouldn’t land without her bone-deep vulnerability. If Fighting With My Family didn’t already have a home, it would sell for some outrageous sum here in Park City, where distributors throw all the money at films that send buzzes of pleasure through packed theaters. Amazon, especially, came to Sundance to splurge—they’ve closed the biggest deals this year, spending $14 million on both The Report, which I’m catching up with tonight, and Brittany Runs A Marathon, which I’m not. The studio’s other big acquisition is another story of a young woman tossed headfirst into a demanding industry: Late Night (Grade: C+), Nisha Ganatra’s workplace comedy set behind the scenes of a nighttime talk show. Mindy Kaling, who wrote the script, stars as Molly Patel, an eager comedy buff with no professional writing experience (she works as a manager in a chemical plant, doing bits over the loud speaker) who parlays a late show’s half-assed diversity initiative into a job within its all-white, all-male writers room. Her new boss from hell is Katherine Newbury (Emma Thompson), an Emmy-winning talk-show host who’s been coasting for years on her legacy, telling safe jokes to a dwindling viewership. She’s particularly awful to her writing staff, barring them from set and assigning each of them a number rather than bothering to learn names. A kind of comedy-world cousin to The Devil Wears Prada, Late Night has no shortage of topics to chew on, particularly in regards to showbiz gender politics—the hurtles placed in front of women in front of and behind the camera, but also how identity determines which material is open to whom. (As the only woman in network late night, Katherine can tell jokes her peers can’t, or so Molly argues.) But this isn’t a single movie so much as two separate ones awkwardly sutured together. Katherine’s film is the better of the two, by virtue of leaning on Thompson’s terrific, complicated performance as a veteran entertainer who’s devoted her whole life to the work, never needing to worry if people found her “likable.” Molly’s half is thinner, a self-actualization sitcom. They never quite cohere, and both ultimately lack the very bite missing from Katherine’s fictional talk show—the closest to a truly withering gag here is Ike Barinholtz’s amusing Dane Cook impersonation, though even that’s a little past its sell date. “Your earnestness can be very hard to be around,” Katherine tells Molly at one point, and I’m inclined to agree. Perhaps Late Night’s earnestness would be easier to swallow outside of Sundance, where every other movie threatens to kill you with kindness. Or maybe I’m just a hopeless grump. I felt a little worn down, too, by the supernova sincerity of The Last Black Man In San Francisco (Grade: B), about two friends, soft-spoken Jimmie (Jimmie Fails) and eccentric artist Mont (Jonathan Majors), trying to lay claim to the former’s elegant childhood home, built and then lost by his grandfather in a rapidly gentrifying neighborhood. But if Joe Talbot’s overlong city symphony is a little sentimental for my taste, it’s also the all-too-rare Sundance drama to boast an extravagant, singular stylistic language: lurching zooms, spectacular wide-takes, elegant slow-motion, colors vibrant enough to have been pulled straight out a musical, a truly transporting orchestral score by Emile Mosseri. This, too, is a film of ideas, and if Talbot’s heart ultimately overwhelms his head, I’m still grateful for how he turns his eponymous locale into a grand mosaic and canvas, crossing the bay to search for the city’s identity, one year after a pair of Sundance films put the magnifying glass on Oakland. Were one searching for a jury prizewinner, this could be the one to beat.